Tempting Texture! 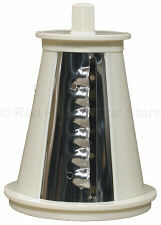 Add an exciting new dimension to salads, stir-fry, sandwiches and much, much more with the Super Shred Cone! This special accessory produces larger, thicker, heartier shreds that can stand up to all kinds of creative cooking. Use it to add instant pizzazz to pasta primavera. Garnish gazpacho in a snap. Make a rich minestrone in minutes. Or, whip up a scrumptious carrot cake. Pile super shreds of mozzarella on cheese bread and deep dish pizza. This handy accessory will add extra texture and extra appeal to all your family favorites. For use with Professional and Professional Salad Shooter Plus electric slicer/shredder.